An early Sunday morning in cold April. 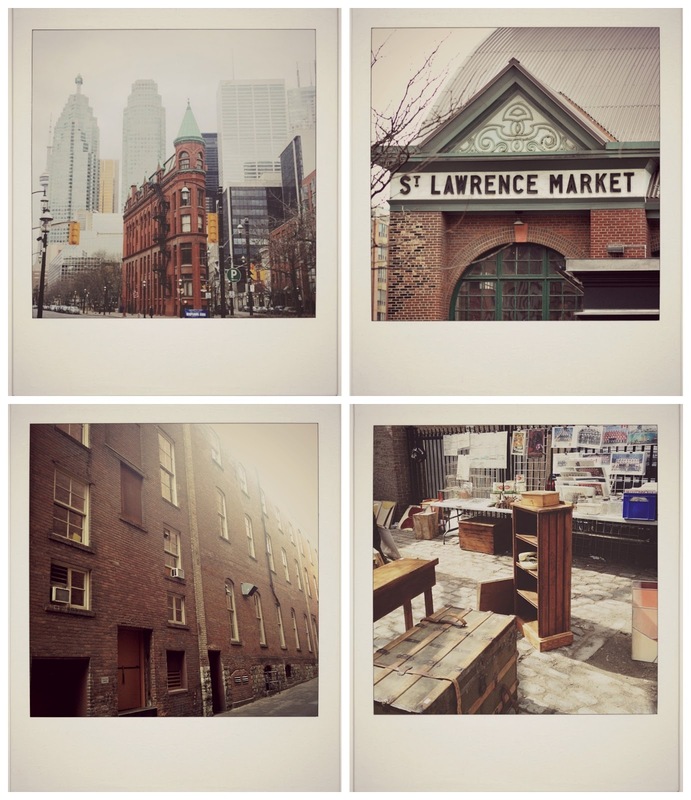 We find ourselves in the Old Town walking slowly toward St. Lawrence Market. The farmer's market is closed on Sunday, but we are heading to the Sunday Antique Market right across the street. Downtown is surprisingly empty, the morning air and light envelop the city and that's exactly how we love it. 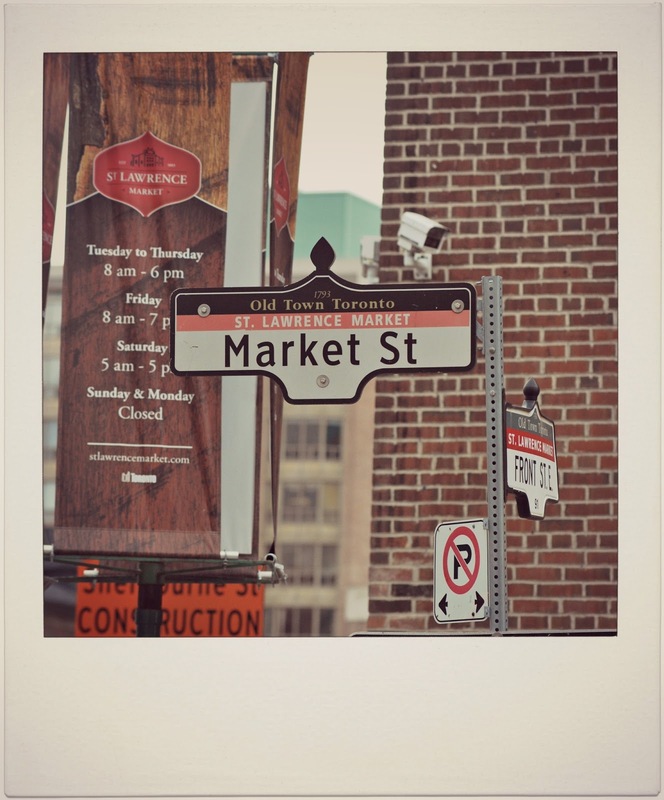 It is the only honest way one can meet Toronto's historic buildings and enjoy its vibrant architecture. And it doesn't happen very often, it is a megalopolis, after all. We are lucky today. Getting up early on Sunday it seems to pay off. Standing on the traffic island at the intersection of Front Street East and Church Street we are catching the 5-story red brick Flatiron Building's narrow end dead center standing proudly in front of two skyscrapers. What many do not realize is that Toronto's Flatiron actually preceded New York's famous Flatiron building by more than 10 years, though the one in NYC gets much more publicity. I left my camera home intentionally. My day is devoted to my family. There is an even more overwhelming excitement when we pass by the spectacular Gothic Revival architecture of St. James Cathedral and the ringing bells fill the moment with joyous sound and a sacralized sense of time. It immediately brings me back to Italy where I spent one whole summer in my aunt's house waking up every morning to the reassuring, gentle, yet solemn bell of the local church. I stop. I breathe. I am present. The slow and steady ringing of the church bells awakens my spiritual pulse reminding me of the significance of every moment, of the marvels that surround me... The wonders of the world aren't far away. Everything seems brighter, everything tastes better, everything is exciting and promising, everything has a pleasant smell, everything we do feels right this day. "Normal day, let me be aware of the treasure you are. Let me learn from you, love you, bless you before you depart. Let me not pass you by in quest of some rare and perfect tomorrow. Let me hold you while I may, for it may not always be so. One day I shall dig my nails into the earth, or bury my face in the pillow, or stretch myself taut, or raise my hands to the sky and want, more than all the world, your return." ~ Mary Jean Irion, "Let Me Hold You While I May"
You can see more of my iPhone photos and Instagram gallery here or click on the button on the righthand side of the blog. What are your weekends looking like lately? I am amazed that you took these images with your iphone!!! Beautiful! Good evening my dear friend! It is therapeutic isn't it, to just go out with your loved ones, forget about worries, enjoy the sights, take it all in. It is good to see you post and I have been enjoying some days off at home. Reading and learning more about poetry is a joy, though our weather still is winter-like, while everyone else seems to be enjoying spring! It was a pleasure to see your comment come in today my dear. I had a very special post prior that I was hoping you would see, but I had to post this new one because I felt so compelled to contribute my share. So many could be celebrated, immortalized in a piece, but I wanted to focus on that one 8-year old boy. I wanted to focus on his NEW LIFE and not glorify the darkness, but rather, the light. Thank you for commenting. Joining dear Anita..."how gentle and sweet is your world"...well, darling Sylvia...it takes a special heart and soul to see the world through beautiful eyes like yours. You have a brilliant gifts for words, photography, but most-importantly...for soul-craft. Thank you for sharing this special day. These images are absolutely incredible! Thank you so much! 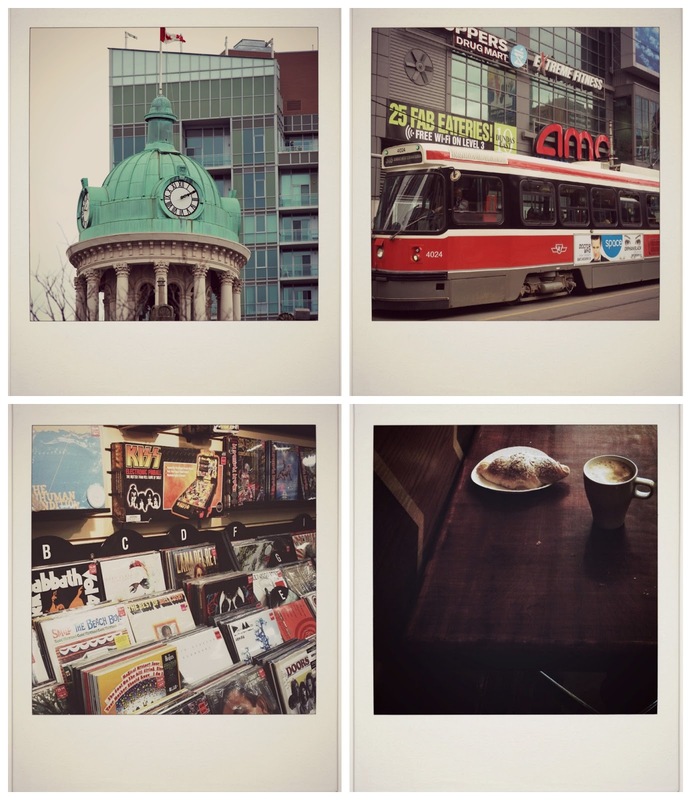 Lovely photos - thanks for the virtual trip! I have never visited Toronto, but it is definitely on my "bucket list". Thanks for the tour - it was fun to tag along! Such a nice commentary on your day out with your loved one. I really enjoyed that last quote. Spending time with family or friends without interruption is, indeed, a gift. 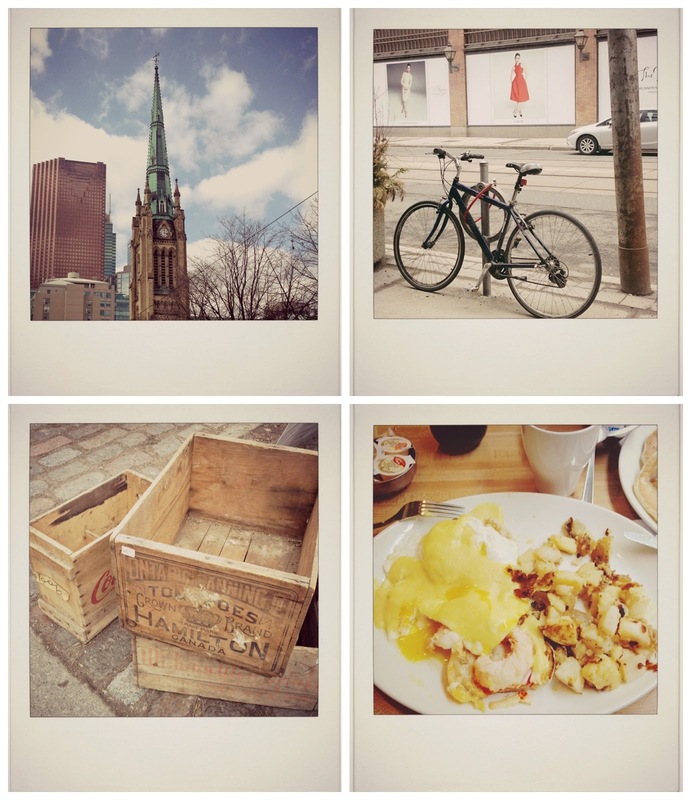 It's been a while since I've been in Toronto so I enjoyed seeing your photos. I've been in the US for three months and its wonderful to see pics from home.